European news portal Euractiv.com last week obtained a leaked draft proposal of the Audiovisual Media Services Directive (AVMSD), which regulates broadcast and on demand media at the European level. As hoped by many health scientists and NGOs, the proposal underscores the importance of protecting young people against harmful media content, including alcohol advertising. However, worries arise over a proposed stronger reliance on self- and co-regulation of the industry. While the leaked document has stirred media reactions especially concerning a European content tax (nonlinear media providers such as Netflix and ITunes, would be subjected to a tax, from which new European media productions would be funded); a requirement for nonlinear media services to have at least 20% of their programming to be original European content; as well as a relaxation of television advertising times; less fuss is made about what the draft proposal says about the protection of minors against advertisements for salty, fatty, sugary, and alcohol products. So, what does the draft say about alcohol? Later on in the proposal, in prefix 34 the example of a good practice is given in the form of including responsible drinking messages as per the code of conduct. This is an example, which has been criticized by scientists and NGOs, because in the hand of alcohol producers the responsible drinking message becomes part of the marketing effort (Journal of Drug and Alcohol Dependence). In the paragraph ‘the choice of the instrument’ the proposal describes why self- or co-regulation have been chosen. The document states that: ‘Such regimes are deemed to be broadly accepted by the main stakeholders and provide for effective enforcement.’ EUCAM would like to point out that in case of the alcohol industry and protection of public health, such schemes are actually proven not to be effective (IAS, Addiction Journal, WHO). 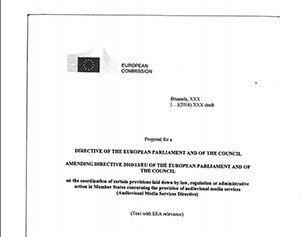 Of further interest is that the proposed document will give member states more options to take action against violations of their media regulations from abroad targeted at their own population. For this, see prefix 19, 29 as well as article 4 and article 5 ter. EUCAM will give updates on further news on amending the AVMSD as it becomes available.